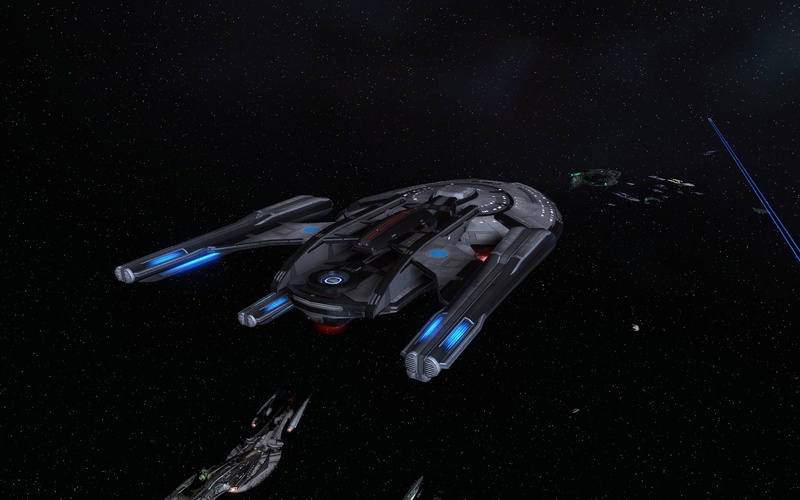 STAR TREK ONLINE | something from the retrospective past- Constellation class coming up soon…? In itself the Constellation class is a ship or Heavy cruiser that you can move on to from a basic cruiser… like the constitution, Exeter, vesper…. Looking at the bridge console stations… It’s basically a engineering tactical and Science mixed ship… in a way you could utilized the universal ensign station in either three departments depending how on you bridge offices skillsets…. Weapons load out it’s a beam boat with given to maximized shields rotation and beam arrays cool downs… with having two beam one torpedo launcher in forward… either having the same in after or one more beam array to maximizes every single vantage point..
Also one thing to note it comes with a unique console a Warp Burst Capacitor console… in which is “The Picard Maneuver” giving you a the ability to confuse your opponents sensors.. also making them think that there are version of your vessel.. Placing your ship in a very good distance so you surprise them with your full onslaught of fire power..
Fleet variant Tier five- Heavy Cruiser- Cheyenne, Stargazer, and Dakota class – as you compare the stats..
← ASTRONOMY | the newly Star Walk two- epilogue…?